Are you currently selling your artwork on-line or anticipate doing so in the future? 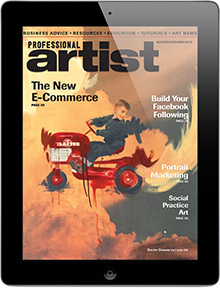 If so, check out the article in the October/November 2015 issue of Professional Artist Magazine titled Finding Your Place in the New e-Commerce. More than ever before, new options have opened up for selling artwork on the world-wide-web. You thought Pinterest was just a place to pin-up pretty pictures on an on-line bulletin board? It’s capabilities have been expanded to include a “buy it button” integrated with an artist’s store on Shopify. According to the article in Professional Artists Magazine, “It’s made closing a sale even easier through a Pinterest app for Android users.” This is just one advance in technology for on-line art stores. Things are advancing at a rapid pace and the article in Professional Artists Magazine addresses the issue of commission, shipping and handling, direct sales integrated with social media and the on-line version of the red dot. “I already have a website,” you say? Does it have an e-commerce plug-in? Increase your visibility and exposure by adding a way to sell your art beyond brick and mortar galleries and stores. The tools for on-line selling of art work has come a long way and art collectors are looking for convenience. This blog is brought to you by Cornerstone Fulfillment Service, LLC. A company specializing in e-commerce and e-marketing for independent publishers. See you back here tomorrow on All Things Fulfilling. We will be featuring a few stories about professional development opportunities I had last week as a writer. Happy Film Friday! A documentary film for music lovers is the subject of today’s blog on All Things Fulfilling. According to MovieInsider.com, All Things Must Pass will be released October 16, 2015. 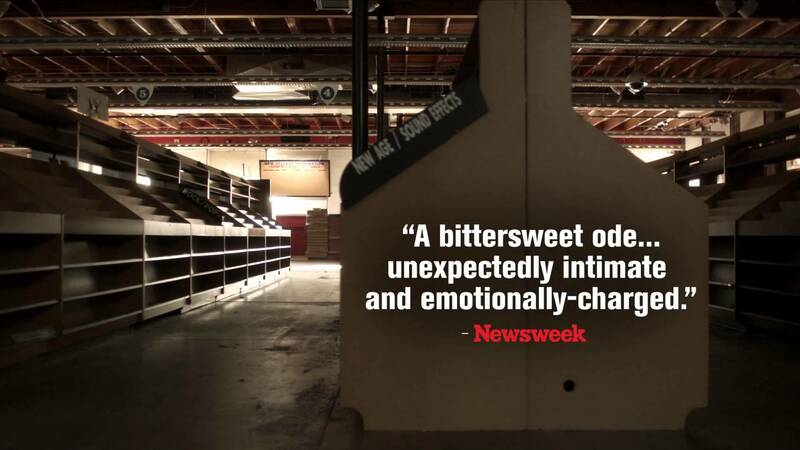 This film is about a company that began in a drugstore and grew to a $1 billion dollar industry by 1999. 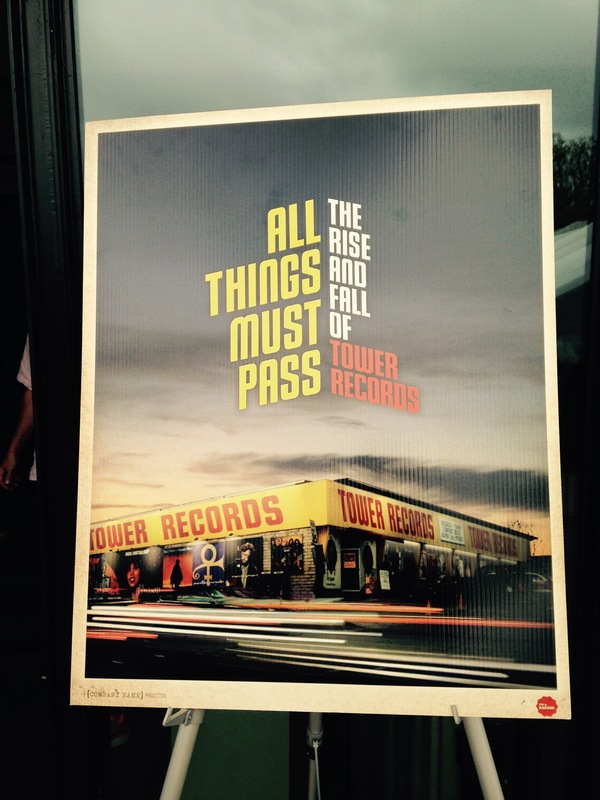 Many claim the beginning of selling music over the internet lead to the demise of Tower Records. This company, which was birthed some thirty years previously, was forced to close due to technology advances. Many changes have taken place since the days of going to a brick and mortar music store to buy vinyl records. The need to purchase cds in this digital age has been replaced with downloading sounds to MP-3 players, cellphones, computers and other digital devices. Any time of day or night you can add to your library of audio sounds. 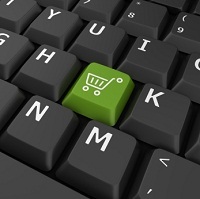 Convenience for the consumer through e-commerce has become of utmost importance in this busy world of ours. Have a terrific weekend everybody. See you on Monday. This blog is brought to you by the EVVY award-winning author of Gift of a Lifetime: Finding Fulfilling Things in the Unexpected. 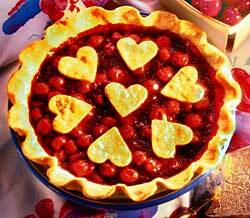 Gratefulness is the gallantry of a heart ready to rise to the opportunity a given moment offers. Well, I suppose I am celebrating National Hubble Day in my own kind of way because today I am celebrating all who have expanded my world by introducing me to the world of independent publishing. It all started back in 1998 when I was hired by West Wind Fine Art, LLC to handle the internet sales of the publication which became a smash hit for painters “Everything I Know about Painting” by Richard Schmid, published by Stove Prairie Press, LLC. (an independent press). At the time, hardly a soul was selling books over the world-wide-web. Oh…how things have evolved. Never would I have dreamed that the position at West Wind Fine Art, LLC would have launched me into an entirely new cosmos. And an even more far-fetched idea of penning my own book! It’s due to be released this spring. Well, things have changed in my world and in the publishing world – dramatically! Ordinary people with extraordinary stories are now writing, publishing and selling books through the power of e-commerce and e-marketing. To read a report on the industry with some of the latest statistics, please visit this link. http://bit.ly/1dt6xv9. Today, I’ll eat a piece of humble pie and look back at the changes in technology that have made independent publishing possible for people who have great stories to tell but would not have had a prayer of having a their stories told and sold traditionally. This blog is brought to you by www.CornerstoneFulfillmentService.com. Look forward to your return to All Things Fulfilling tomorrow. Communications have evolved in so many ways since the days of TVs with rabbit ears and transistor radios. I really couldn’t explain to you how information was broadcast and received back then, or even now, with digital equipment. I just have faith in those who develop the technology to make it happen. But, I can assure you that information travels to places you never thought possible through the world-wide-web. You’d have to be living under a stone not to notice that the marketing, promotion and advertising landscape has changed dramatically. 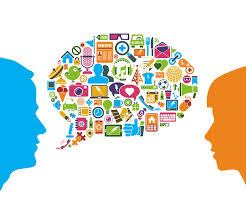 It has gone from “print to digital.” Using social media and e-marketing communications means that what ever is put out into the world digitally will transmit to others and will be spread in ways that we can not fathom. Sure, anyone can use it, but, you also need to know how to use it effectively, so the right “antenna” will receive it and it is not just a big time waster. Business owners (and that includes you, independent publishers) – its 2014! It’s beyond time to move out of the dark ages and begin learning something about how to promote your products and services using digital communication tactics. A company that specializes in e-commerce and e-marketing for independent publishers can help you with that. This blog brought to you by www.CornerstoneFulfillmentService.com. A company where independent thoughts, words and views are all part of the business. See you tomorrow on all things fulfilling. A Company Specializing in e-commerce & e-marketing for Independent Publishers. According to a recent article in Publishers Weekly Magazine, sales in e-books have dipped a little from when the Kindle and the Nook were initially rolled out. However, e-book sales have remained strong, jumping a total of “4,456% since 2008.” That is a big deal and e-books have become a “billion dollar industry” according to the article. Here is a link so you can see all the e-book selling statistics from 2008 – 2012. http://bit.ly/Hc3JVq. We won’t see the 2013 book sales results for a few more months. In my opinion, there will be more technological developments coming that will blow away any remaining doubts that e-books are just a passing trend. Especially as digital publishing becomes integrated into more classrooms and library catalogs. Authors don’t miss out on a stream of income by failing to offer an e-book version of your title. And remember “if you are selling over the internet, you must be marketing over the internet” because that is where your potential book buyers hang out! Speaking of hang-outs, thanks for frequenting this website. Do return tomorrow to www.AllThingsFulfilling.com tomorrow, the blog of www.CornerstoneFulfillmentService.com. The e-book industry now represents 33% of book sales. How about that? People like having a choice of formats, so offering books in print, as well as an e-book version is wise marketing. There is still a viable market for books-in-print but there is a certain part of the reading population who are clamoring for e-books due to their convenience. Surprisingly, people who are 55 years of age and over ARE BUYING e-books, contrary to what was expected. It is not just the young generation that are interested in the digital format. We discussed pricing of e-books and how you can leverage your intellectual property. E-books make it easy to offer samples, providing potential book buyers the opportunity to see if they like an author they’ve never read before. A big advantage to e-books – there is no printing involved, thus it removes the need for physical space of inventory. If you are a writer who wants to get on The Fast Track to Independent Publishing, here is a short webinar that will introduce you to the basics. http://bit.ly/10cCp1Y. Do return tomorrow to All Things Fulfilling, we will be discussing the next best step if you are a person who is considering independent publishing and you are in need of knowledge. I will tell you a quick but valuable story from this weekend. This blog brought to you by www.CornerstoneFulfillmentService.com .